HONG KONG, Oct 30, 2018 - (ACN Newswire) - Organised by the Hong Kong Trade Development Council (HKTDC), the 20th Hong Kong International Lighting Fair (Autumn Edition), the third Hong Kong International Outdoor and Tech Light Expo and the 13th Eco Expo Asia concluded with a record number of over 73,000 buyers from 154 countries and regions visiting the three events - an increase of 6% on last year's attendance. HKTDC Deputy Executive Director Benjamin Chau said that the increase in buyer attendance showed the three concurrent fairs had been successful in creating synergy to help build an effective cross-industry sourcing platform. The number of buyers from many markets -- including the United States, Mexico, Chile, Russia, the Czech Republic, the United Kingdom, Kazakhstan, Indonesia, Vietnam, Malaysia and Korea -- saw significant growth. He also noted that based on an on-site survey conducted at the Autumn Lighting Fair, the industry in general is cautiously optimistic about the business outlook for next year, while smart city and smart home trends will continue to drive the development of the lighting industry. The HKTDC commissioned an independent on-site survey during the Autumn Lighting Fair and Outdoor and Tech Light Expo. Among the 658 exhibitors and buyers interviewed, 53% of respondents said they expected the ongoing Sino-US trade friction to have a negative impact on export performance. However, 86% of respondents expected to see either improved or stable market prospects in 2019. In terms of specific markets, respondents were most optimistic about Japan, with 80% viewing the country as having strong market potential, followed by the Korean, ASEAN and Middle Eastern markets (76%). Regarding products, 28% of respondents considered LED lighting products to have the greatest growth potential in 2019, followed by residential lighting (23%) and smart lighting solutions (21%). More than 90% of respondents expressed a belief that the development of smart cities and the smart home will have a positive impact on the lighting industry over the next two years. As Internet of Things (IoT) technology continues to mature, it is driving the development of both the smart city and smart home. The Smart Home Gallery made its debut at the Autumn Lighting Fair to showcase smart lighting products from Opple, Philips and Tuya, as well as a smart platform from Jingxun (a partner of Tmall Genie AI Union) and Yeelight (a Xiaomi Eco-System company). The Smart Lighting & Solutions Zone featured an array of lighting designs, software, management systems and smart lighting design solutions. The fair also featured a Smart Lighting Development Forum, where industry experts discussed the latest developments in smart home lighting and IoT technology. The Outdoor and Tech Light Expo showcased lighting products and solutions for industrial and commercial buildings, outdoor areas and professional venues such as warehouses and production houses. The inaugural Horticultural Lighting Zone presented grow lights for plants in outdoor areas such as farms, domestic gardens and public parks. Various forums and seminars were held during the fair period, focusing on a range of issues such as smart road lights, horticultural lighting and testing and certification services for lighting products to highlight the latest industry trends. Taiwan Aspire Lighting Co., Ltd. has been in business for 20 years, targeting North America as its major market. Lynn Yang, Manager of the company, said that Aspire is a decorative lighting designer and producer based in Taiwan, but with production facilities on the Chinese mainland. The company has been exhibiting at the Autumn Lighting Fair over the past few years to promote its self-developed lighting fans, with more new designs being showcased in 2018. Buyers have responded positively and expressed interest in Aspire's lighting fans that combine a stylish lighting fixture with a ceiling fan. Ms Yang said: "The feedback has been even stronger than last year as more buyers approached us this time, including buyers from Spain, Italy, Malaysia, Singapore and Vietnam. We've also met with more American buyers, even though the mainland and the US are currently embroiled in a trade conflict. So far, the trade war has had no obvious impact and American customers are still keen to do business with us. The extra tariffs may give us pressure but we will work with our customers to deal with the challenge together. At the same time, we will continue to diversify our market exposure to mitigate any unfavourable impact from the trade dispute, and this fair is a good place to explore new opportunities." Nasa Aydinlatma is a Turkish company established in 1971 that runs a factory and a wholesale business. The company's Export Manager, Taner Yuksel, is a frequent visitor to the Autumn Lighting Fair where he has developed long-term partnerships with 11 regular suppliers from the Chinese mainland. To date, he has already bought finished products and components valued at US$600,000. He also visited the Outdoor and Tech Light Expo, saying: "The 2018 edition shows marked progress in terms of the quality of exhibitors. Through the HKTDC business matching arrangement at the expo, I have identified some manufacturing companies that suit my needs, offering garden lighting, modules for streetlights, CCTV systems for streetlights and some drivers. I will visit their factories after the event." The HKTDC's Mr Chau noted that, with the ongoing development of the Guangdong-Hong Kong-Macao Greater Bay Area, local governments are now keen to promote a greener, low-carbon economy, creating enormous investment opportunities in the areas of environmental pollution control, waste management and energy-saving products and services. In view of this development, this year's Eco Expo Asia featured the new Guangdong-Hong Kong-Macao Greater Bay Area Zone, where cities such as Guangzhou, Zhaoqing and Foshan presented the latest green opportunities, while various Greater Bay Area government officials and corporate representatives shared their insights on green policies and market trends to promote greater collaboration on environmental issues. The expo featured a total of nine thematic zones to meet the latest market needs. Among them, the Water Treatment and Quality Management Zone showcased technologies and equipment such as marine protection, sewage treatment and system maintenance, waste water recycling technology and water purification equipment. Fourth-time expo exhibitor Enviro Process Technologies Co Ltd (Hong Kong) displayed multiple water-processing machines including a dehydrator and accessory equipment for adhesives and solvents. "We met many new buyers and have some orders confirmed from private sectors and government departments. Eco Expo Asia has helped us achieve our exhibiting targets. We will come back next year with a bigger booth," said General Manager Matthew Ho. The expo's Startup Zone continued to be in the spotlight, with 20 Hong Kong start-ups attracting plenty of attention by showcasing the latest green ideas and product technologies. The companies included So Organic Biotech Enterprise Ltd, which develops organic fertilisers and natural probiotics and bio-nutrients for pets under the SOBE brand. "We have talked to potential buyers from Canada, Chile, Dubai, the Philippines and the United States, and are now negotiating with a Hong Kong waste treatment company which has expressed a strong interest in our micro-organism EM solutions," said CEO and co-founder Jane So. She added the expo offered an effective platform for start-ups to expand their business networks, while the Startup Forum provided the company with an opportunity to explain its concept and products in detail, which received positive feedback. Supported by the Environment Bureau of the Hong Kong Special Administrative Region (HKSAR) Government, Eco Expo Asia was attended by over 320 representatives from listed companies and government departments, who promoted green sourcing among both the public and private sectors. Another highlight of the expo was the Eco Asia Conference, where nearly 40 government officials and experts from eight countries and regions shared insights on a range of hot issues. In line with the expo's theme, the HKTDC adopted a range of green waste-reduction measures. 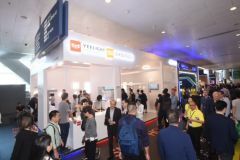 In addition to e-badges to reduce paper use, exhibitors were encouraged to upload product information to hktdc.com to reduce the amount of printed promotional leaflets and to reuse and recycle any exhibition materials they used. The fairground also used energy-efficient spotlights, reusable decorations and carpet-less passageways to make the expo a thoroughly green venue. In addition, the Environmental Protection Department of the HKSAR Government collaborated with Secure Information Disposal Services Limited to deploy green ambassadors to promote the government's Green Charter at the expo, encouraging exhibitors to support waste reduction and recycling. Local social enterprise BottLess provided visitors with reusable eco cups, offering a plastic-free eco-friendly exhibition experience. 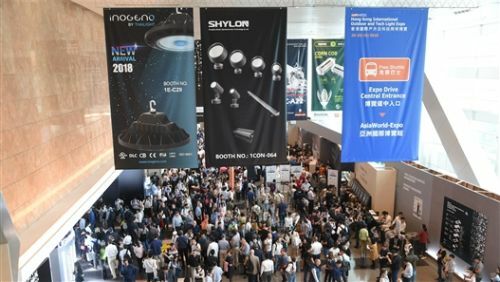 Gathering more than 3,100 exhibitors, the Hong Kong International Lighting Fair (Autumn Edition) and Hong Kong International Outdoor and Tech Light Expo attracted more than 44,600 visitors and over 13,600 buyers respectively, forming the world's largest lighting marketplace. 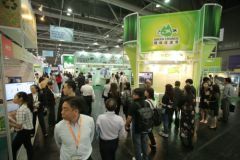 Meanwhile, Eco Expo Asia, jointly organised by the HKTDC and Messe Frankfurt (HK) Ltd, and co-organised by the Environment Bureau of the HKSAR Government, featured nearly 340 exhibitors and attracted more than 14,800 buyers. The Autumn Lighting Fair was held from 27-30 Oct at the Hong Kong Convention and Exhibition Centre (HKCEC). The Outdoor and Tech Light Expo was held from 26-29 Oct at AsiaWorld-Expo, alongside the concurrent Eco Expo Asia which was held from 25-28 Oct. The three parallel fairs offered a one-stop sourcing platform and synergy to provide more cross-industry business opportunities.